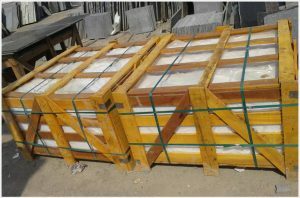 Once the product is checked on pre-defined quality parameters, safe packaging and shipment certainly become imperative for the maintenance of the desired quality of the natural stone product until it reaches the customer or gets installed at the desired location. 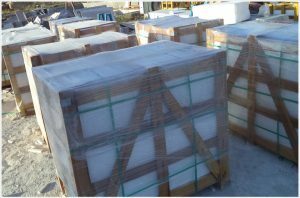 To confirm all these, Regatta Universal Exports has a well-maintained infrastructure for packaging and shipment of the stone products. Tough and sustainable wooden frames are prepared on site, inside which natural stone products are fastened tightly to avoid any movement or jerk. Further, styrofoam, foam sheets and plastic sheets are placed in between the tiles to prevent any scratch or edge/corner chipping. 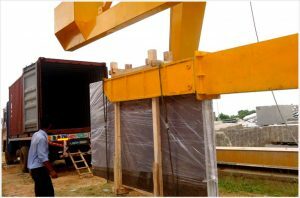 Moreover, Regatta deploys specialised machinery for smooth loading or unloading of the packed product. Each product has been tightly packed to make it fit for long-period transportation that might include land, sea or even both. 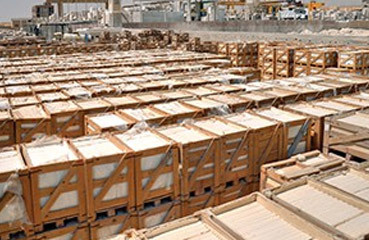 At every stage, right from loading of product inside a container at the natural stone manufacturing factory to unloading of the same at the desired location of the customer (anywhere in the world), utmost care has been taken to maintain the quality of the product. However, in case a customer faces any product damage or breakage due to mishandling of cargo by transport companies or shipping lines, he/she would then be liable to get a claim on an insurance that has been taken on the customer’s behalf by Regatta Universal Exports. This claim covers any damage to the product that might occur from the time of its loading at Regatta’s factory until it reaches the customer’s warehouse. Timely delivery is of immense importance for us; hence we count it as an integral part of our customer service and quality control division. To make sure that our customers receive the desired product within the committed time frame, a dedicated team at Regatta oversees the well-timed processing, production, quality checks and shipment of the final stone products. A happy and satisfied customer is all we wish after every deal, which further warrants long-term relationships with our existing customers. Further, Regatta Universal Exports would feel immense pleasure in providing references of our pre-existing customers to a prospective one, which eventually gives potential customers a chance to personally know about Regatta’s work quality, efficiency, reliability and business ethics.